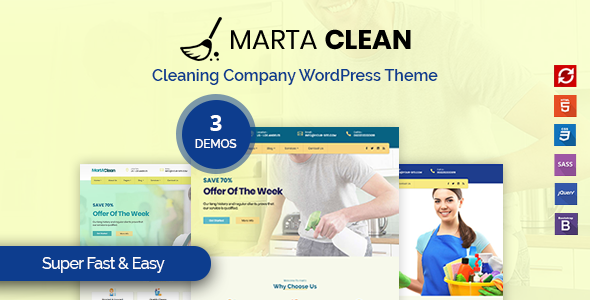 Marta : professional and flexible Cleaning Company WordPress Theme . Marta includes the Revolution Slider and WPBakery Page Builder drag and drop page builder to help you edit your content immediately. This WordPress theme provides the flexibility to tailor a Cleaning firm/company website design. This is one of the latest additions to the Cleaning WordPress theme Marta comes with most advanced live website builder on WordPress. Featuring the latest web technologies, enjoyable UX and the most beautiful design trends. Our theme provides a platform to simply dragu0026amp;drop elements, choose styles and play around with the look and feel of your site with an instant preview, before your changes go live. Compatible with WooCommerce 3.3.x, Visual Composer 5.1.x, Bootstrap 4.x. Marta has been tested with browsers Firefox, Safari, Opera, Chrome, Edge.